The RF Explorer RackPRO™ is a spectrum analyzer and frequency coordination platform for A/V professionals using wireless audio equipment. One RF Explorer RackPRO system includes both a physical 19” rack mounted unit, and a copy of Clear Waves frequency coordination software for Windows, or optionally a copy of RF Venue’s own Mac OSX frequency coordination software. 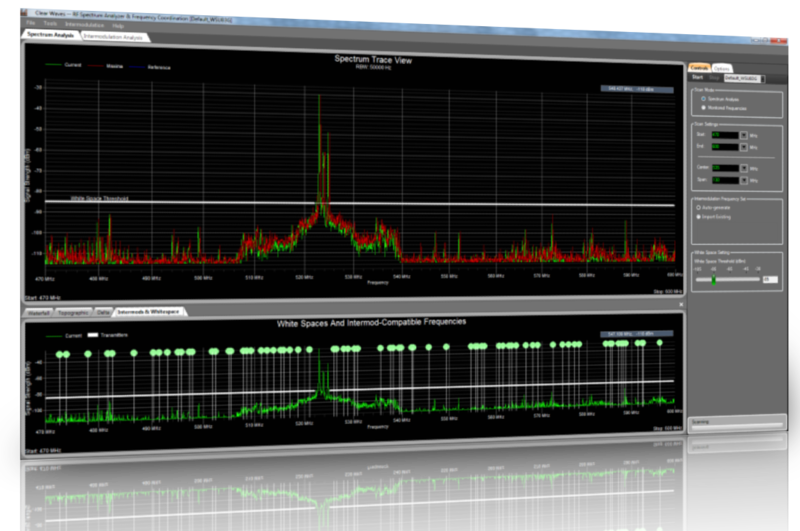 The cost of RF Explorer RackPRO bundled with Clear Waves software is only $849 USD. 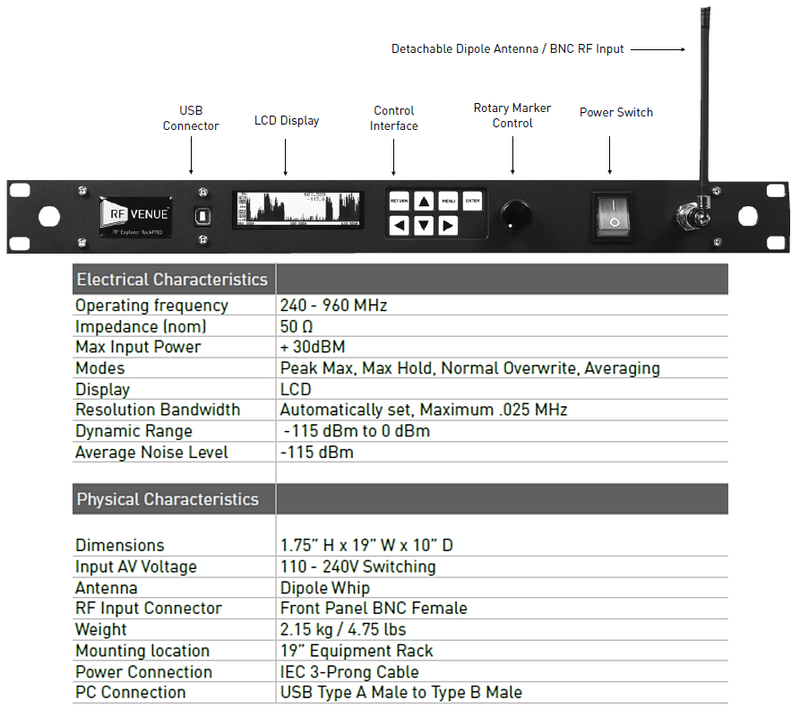 The RF Explorer® RackPRO™ is a hardware and software spectrum analysis platform designed to manage and monitor any wireless audio system from a laptop or equipment rack. Powerful frequency coordination and live interference monitoring is now easy to master and within budget for venues large and small. While most spectrum analyzers offer laboratory precision across wide frequency ranges, the RackPRO is designed with essential features that operate only in the range required for wireless mics and IEMs. Easy to use. No prior RF engineering experience required. 1 RU 19” rackmount form factor for integration with existing portable and installed equip-ment racks, modules, and closets. Perfect balance between affordability and features. Delivers everything professionals need for complete analysis and coordination of wireless microphone and IEMs at a price every or-ganization can afford. Intermodulation tools. Calculate sets of intermod-free frequencies. Edit and export sets as PDF, CSV, or Shure® Wireless Workbench compatible files. Mac and PC compatible. Clear Waves for Windows, and Mac OSX software coming June, 2014. The included Clear Waves PC software allows you to instantly calculate sets of intermod-free frequencies molded to the spectrum inside your facility- not from a static FCC or equipment list database. Choose to let Clear Waves do the work or fine tune whitespace thresholds, step size, and other parameters. Edit and export frequency sets to PDF, .CSV, Professional Wireless Systems® IAS, or Shure® Wireless Workbench compatible files. In the context of wireless audio devices, intermodulation distortion (IMD) occurs when radio waves from one transmitter leak into another. The two carrier frequencies “mix” to create new, spurious radio waves at predictable frequencies — called intermodulation products (‘intermods’ for short). Analog transmitters in close proximity will always generate intermods. When coordinating frequencies it is important to ensure the frequencies assigned to your audio transmitters are not clobbered by intermodulation products. ‘War-Gaming’ is a procedure perfected by James Stoffo at Radio Active Designs. It allows you to test the frequencies you’ve assigned to your wireless gear in a real world setting.